Advance4Training is best Training and Assessment provider for the construction industry services sector in London, Birmingham and surrounding area. We are dedicated for a quality training, We deliver skills, with a set standard that is required in the industry. We are a cert-ain, adSkills, and EAL approved centre. We offer a full range of vocational training courses including Gas, Plumbing, Electrical, Renewables, Energy, and Online Courses. We are registered with Gas Safe and provide free guidance to register with Gas Safe after finishing the Gas Course. So whether you are the New Entrant to the industry or are looking to extend your knowledge, take a look at our course page to see what is available for you. Our training centre has been developed to offer a more personal, relaxed and friendly experience, while ensuring appropriate technical and practical content. Call us to become a Certified Gas Engineer within days and be qualified to register as Gas safe engineer. Our gas training facility provides you to get through your nationally accredited certificate scheme (ACS) qualification in domestic & commercial natural GAS and LPG. Become a qualified plumber after a short course and get a certificate for PLUMBER COURSE and get ready to join Gas Course in near future. We deliver plumbing training and assessments. This facility provides you, domestic hot water storage system (including un-vented) and water regulations. Call us to become a green energy certified engineer. Renewable energy certificate is awarded for your training. 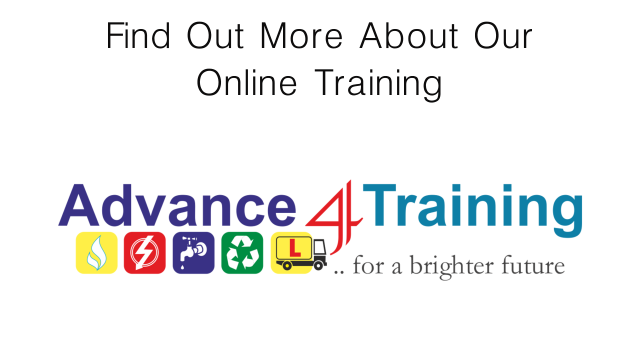 Advance 4 Training delivers renewable energy training. This training includes solar PV systems, solar thermal and heat pumps (Air & Ground). Our energy & green deal training includes Domestic Energy Assessor (DEA) Green Deal Advisor / Installer, Non Domestic Energy Assessor (NDEA) and Non-Domestic Green Deal Advisor Courses. Get electrical engineer certificate and become fully qualified electrical installer with a short electrical course. Our electrical training facility delivers part ‘P’ full scope 18th edition BS7671:2018, initial verification and cert- ification periodic inspection testing, certification & PAT testing courses. We provide online health & safety courses. Complete your training at home as you feel ready for assessment contact us and get certified. Click anywhere in this box for more information. A huge number of Electrical Installers are successfully working in market after completing Inspection and testing course or PAT courses.